Olindo Franco Mare (born June 6, 1973) is a former American football placekicker. He was originally signed by the New York Giants as an undrafted free agent in 1996. He played college football at MacMurray College and Syracuse. Mare, who was selected to the Pro Bowl in 1999, has also played for the Miami Dolphins, New Orleans Saints, Seattle Seahawks, Carolina Panthers and Chicago Bears. Olindo Mare now is a part owner of a local car restoration business in Denver, NC called Klassic Rides. While in 2004 season, when Mare was out with a calf injury, current St. Louis Rams wide receiver Wes Welker replaced him and became only the second player in NFL history to return a kickoff and a punt, kick an extra point and a field goal, and make a tackle in a single game. He missed his first field goal attempt of the 2007 season against the Indianapolis Colts. 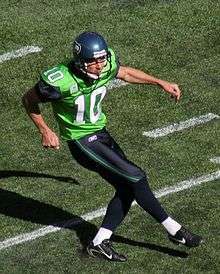 At the midway point of the 2007 season, Mare had made exactly half of his field goal attempts. He also missed 3 field goals in the final preseason game. Early in the season, it was revealed that Mare injured his groin muscle, and punter Steven Weatherford took over on kick-offs for a few games. While playing the Jacksonville Jaguars, Mare missed his second attempt of the game, and ended up being called on again only a couple minutes later after the Saints intercepted and drove back into field goal range. Fans booed Mare as he walked on the field to attempt the long shot (over 50 yards), which he missed. Despite the reaction of fans, and his extremely poor play, head coach Sean Payton continued to stand by the kicker until he was injured in the second game against the Atlanta Falcons, and replaced with Martín Gramática. On February 27, 2008 he was released from the Saints after only one season. After the Panthers released popular kicker John Kasay, the Panthers were looking for a proven kicker. On July 27, 2011, the Carolina Panthers signed Olindo Mare to a 4-year, $12 million contract. However, a year after signing the deal, and after missing two game-winning field goals, the Panthers cut Mare. On December 11, 2012, the Bears signed Mare to a 1-year deal due to an injury to Robbie Gould. Mare beat out Billy Cundiff and Neil Rackers for the job. Mare played his first game as a Bear on December 16, 2012 against the Green Bay Packers. Mare was successful on both of his field goal attempts but the Bears would go on to lose 21-13. On December 2013, he received a workout with the Lions, but did not make the team. Mare is married to his wife Sandy, with three sons, Hayden, Rylan, and Landon, and one daughter, Kayla. Mare is mentioned in Wale's song "TV in the Radio" in the line "I kick it, kick it like Olindo." Mare is a fan of the Italian soccer team Juventus since his father was born in Rota Greca, Calabria. Mare is briefly featured in the music video for "Jigga Jigga!" by Scooter (band) during a game against the San Diego Chargers in the 2003 season for the Miami Dolphins. He is shown momentarily about 8 seconds into the music video. ↑ "Olindo Mare". Carolina Panthers. Retrieved September 23, 2011. ↑ Gantt, Darin (2012-12-11). "Olindo Mare wins Bears kick-off, may get a contract". Profootballtalk.com. Retrieved 2012-12-12.